The decision by Mozambique’s state-run National Roads Administration to solicit the private sector in highway management was a turning point in governmental transportation infrastructure growth that will have a positive impact on the African dream of a transcontinental highway girding the continent.By the end of 2018, private firms will erect tollgates and collect fees on four sections of the main EN1 north to south highway. Government has a huge foreign debt crisis, and necessary funds to expand much-needed road infrastructure are best sought from sources other than additional bilateral loans. The upgrade of the EN1 will improve an important link in the long-gesticulating Trans-African Highway. The project has seen fitful progress over the decades, slowed by conflicts, politics and lack of financial resources. The public-private partnership template, however, offers a new way forward to tackle major infrastructure projects, like the continental highway. The Trans-African Highway is not one proposed road, but rather a system. Launched way back in 1971 at the conclusion of the African independence era by the United Nations Economic Commission for Africa (UNECA), the project is actually a mosaic of nine highways. Combined, these roadways would extend 60,000 km across the continent. The longest leg runs from Tripoli, Libya to Cape Town, South Africa, a top to bottom trek running 9,610 km. Of the planned highways, the second two longest are 8,000 km in length each. The main latitudinal highway traveling east-west is to connect Egypt and Senegal’s capitals, Cairo and Dakar, while the north-south longitudinal highway is to run between Cairo and Cape Town. A shorter but still monumental highway also runs east-west, connecting the major trade cities of the economic powerhouses of East Africa and West Africa: Lagos, Nigeria and Mombasa, Kenya. A massive West African piece of the Trans-African Highway will link Lagos with Dakar at a length of 4,700 km. The remaining links that are to comprise the continental highway are shorter than the ocean to ocean portions, but are still massive compared to existing national highways. These include an Algiers, Algeria to Lagos, Nigeria highway of 4,504 km connecting the Mediterranean with the Gulf of Guinea. Central Africa will be opened to the Red Sea via a 4,200 km N’Djamena, Chad to Djibouti highway, and to West Africa via a 4,500 km N’Djamena to Dakar highway. The length of Southern Africa will be traversed by a 3,520 km highway linking Angola’s Atlantic Ocean port at Liboto with Mozambique’s Indian Ocean port at Beira. 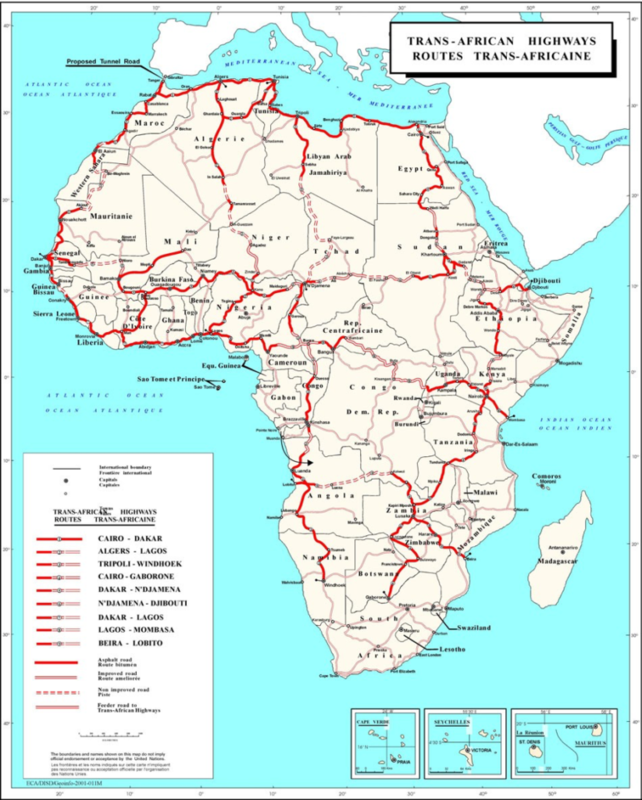 The Trans-African Highway route consists of 9 highways throughout Africa totalling 56,683 km. The ambition is grand. However, only a portion of the envisioned system has been fully completed thus far. Conflict is a principal encumbrance to progress. Road infrastructure work is virtually impossible in unstable Libya, Nigeria (where Boko Haram militias terrorise areas), the horn of Africa and parts of East Africa where civil war, cross-border tensions and terrorism hinder development, and perennially unstable portions of Central Africa. Completed sections in Angola and the Democratic Republic of Congo have been damaged in conflicts. In addition, one of the project’s principal financial backers, the African Development Bank (AfDB), is having highway plans redone to accommodate the new realities of climate change that were unknown in the 1970s. Consequently, as Africa faces transportation costs ranging from 50% to 175% higher than the developed world due to poor infrastructure, the highway is being completed incrementally. Considerable fanfare was heard in Tanzania in May 2018 when AfDB president Akinwumi Adesina joined Tanzania President John Magufuli for a ribbon cutting ceremony to start construction on the Dodoma to Babati Road. When completed, the highway will add only 251 km to the 10,228 km Cape to Cairo link of the Trans-African Highway. Southwest of Tanzania, Zimbabwe has been unable to afford new highway construction in years. The public-private partnership model undertaken in Mozambique is a plausible means to achieve the financial resources that have thus far been the main impediment to the physical growth of the Trans-African highway. While some African governments are wedded to socialist economic agendas, all are loathe to give up control of national transportation infrastructure. However, the leasing of these systems on a temporary but renewable basis to management firms is a way forward to realising the continent’s essential dream of universal highway connectivity. President of Tanzania, John Magufuli, and the President of the AfDB, Akinwumi Adesina at the ribbon cutting ceremony commissioning the Dodoma-Babati Road project – one of the critical links between Cairo, Egypt and Cape Town, South Africa.